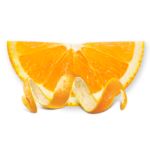 Citrus fans, this one’s for you! Save 20% with our Citrus Bliss Pre Shave bundle, which includes our Citrus Bliss Organic Raw Sugar Scrub and our Citrus Bliss Pre-Shave Oil. Prepare for epic levels of smooth, and be transported by our fresh, invigorating signature Citrus Bliss scent with every use. With zesty orange and floral undertones, and hints of apricot, it’s like sunshine in a bottle! Our products are always all natural, hypoallergenic, soothing, conditioning, and made with love in California. 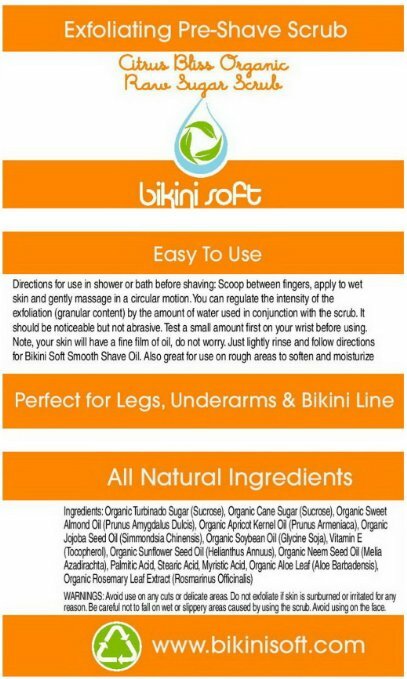 Bikini Soft is bringing the luxury and quality of a spa experience to women everywhere — and that includes a super smooth shave. Exfoliation is the first step to getting that silky smooth feeling that puts an extra bounce in your step. It removes dead skin cells, exposes new, smaller hairs beneath the surface, and allows your razor glide more smoothly for a shave that’s a cut above. 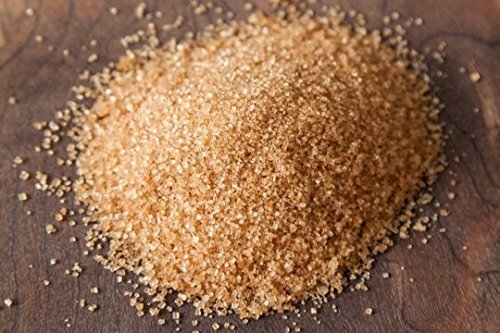 Our Citrus Bliss Organic Raw Sugar pre-shave scrub can be used alone for touchably smooth skin everywhere (even your face! 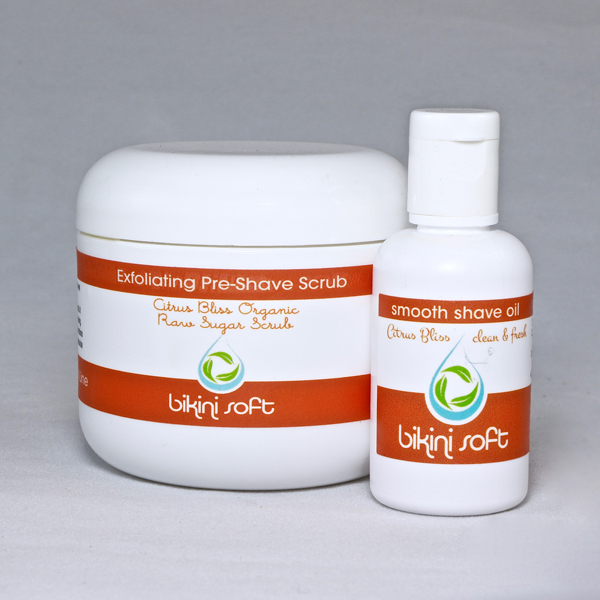 ), or for even better results, as step 1 before our Citrus Bliss Smooth Shave Oil. We’re so sure you’ll love it, we offer a 30-day, 100% money back guarantee. If you’re not happy for any reason, simply return it to us for a full refund, no questions asked. Using our scrub couldn’t be simpler — scoop a little between your fingers, apply to wet skin and gently massage in a circular motion. 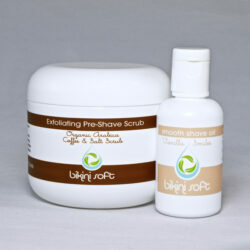 You can also regulate the intensity of the exfoliation with the amount of water you use with the scrub. More water added means a gentler scrub, and vice versa. 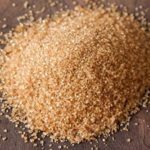 Our scrub is made with organic sugar exfoliants, is never abrasive, and is gentle enough for daily use. Note: The scrub will leave a fine film of oil on skin — this is totally normal! 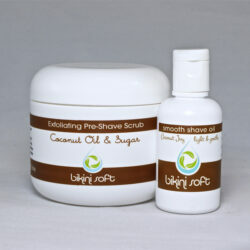 Just lightly rinse and, if desired, follow with Bikini Soft Smooth Shave Oil for an unbelievably close shave. It’s easy! Simply wet skin with warm water, apply 8-10 drops of Bikini Soft Smooth Shave Oil to to the palms of your hands, massage onto desired shaving area, letting the oil soften and smooth skin. Shave as usual, and rinse with warm water. Note: If your razor gets a little clogged while shaving, it’s just the natural oils which are denser (and more conditioning) than foams or gels, and nothing to worry about. Just rinse with hot water and enjoy the smoothest shave you’ve ever had. Pro tip: Put a couple of drops of our Razor Saver Oil on your razor after rinsing to prevent erosion and rusting — it’ll make your razor last three to four times longer. The scrub is amazing, should be a yummy dessert, hehe. It kinda melts on your skin, leaving it glowing and moisturized while it exfoliates. It’s very nice. The oil is a perfect size, you can take it anywhere with you as a few drops goes a long way. I’ve been using the same one for a while now, I found rinsing your razor blade after running it 2 to 3 times on your skin is ideal to get a closer shave and avoid build up on your razor. I just want to say thank you for creating this organic product as women like me with sensitive skin who gets constant razor bumps can now finally enjoy shaving…. If you shave, you need this in their life. The scrub is great and honestly, I’m pretty sure using olive oil would achieve the same result, but this smells much nicer. I’m allergic to everything under the sun, and I get hives any time I shave. TBH I’m not sure if they’re real “allergy” hives or if they’re caused by dermabrasion, but taking my allergy medication helps them, so I’ll just call them hives. Regardless, this shave oil is a godsend to people with sensitive skin. It does clog up your razor a fair amount, but I don’t think it dulls it. You just have to clean it frequently which is a very small price to pay if you have sensitive skin. ©2016 Bikini Soft. All Rights Reserved. Want the best discounts and new product offers? You have to be on the list! You are awesome! We'll be in touch.